Lady Gaga is back in the spotlight! And she is looking incredible once again! So, it’s natural she wins the high heel celebrity of the week with ease! The famous singer is back in New York and she immediately made the headlines. Gaga took a break for a little while, but now she’s back! She was seen in New York being as glamorous as ever. A while back she changed her style a bit to include more glamorous evening dresses. She seems like she likes this style quite a lot. Gaga rocked a very stylish long black dress. It featured a bold split at the front showing off her legs and high heels. Her shoes were also true to her style. Lady Gaga rocked a pair of black patent platform high heels. 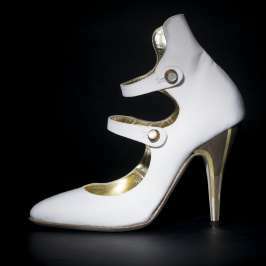 They featured classic peep-toe design and some very high and thin heels. The heels had ankle straps for a bit more balance and style. Even so, they were no problem for her. She walked with grace and style and wowed onlookers. Gaga has changed her look a bit though. She now sports a short hair. She also rocked some accenting makeup to complete her stylish outfit and look. Nicely done!